If there’s one trend that’s reigned supreme over the last few seasons, it’s athleisure—we’re talking sneakers, track pants, hoodies, and everything in between. Looking for new ways to test out the look? That’s where athleisure enthusiast Anaa Saber comes in. In her new column for Who What Wear, the fashion girl behind @oursecondskin will offer up her best styling tricks for those of you looking to inject this cool trend into your everyday lives. Compared to previous years, Copenhagen Fashion Week proved to be one of the buzzier occasions of the season. Especially with brands taking new creative direction—as in the J.Lindeberg showing and, of course, heartthrob brands like Ganni, Saks Potts, and Cecilie Bahnsen—Copenhagen Fashion Week became the sort of occasion nobody wanted to miss. If Scandinavian fashion has taught us one thing over the years, it’s that floral dresses and softer silhouettes reign supreme. But this year, Copenhagen Fashion Week was one to remember, and not just because it was my first time attending the burgeoning, trend-forward scene in person. As an athleisure enthusiast, what with the trend at its utmost height, I wanted to see the influence it would have on the Scandinavian design scene firsthand, and let me tell you: I was more than impressed. Between noteworthy street style moments—picture Haviannas with fancy printed dresses—elaborate set designs, and warehouses to waterfront views, what really stole my heart were the combinations of beautiful silhouettes paired harmoniously with edgy hints of sport and athletic influences. 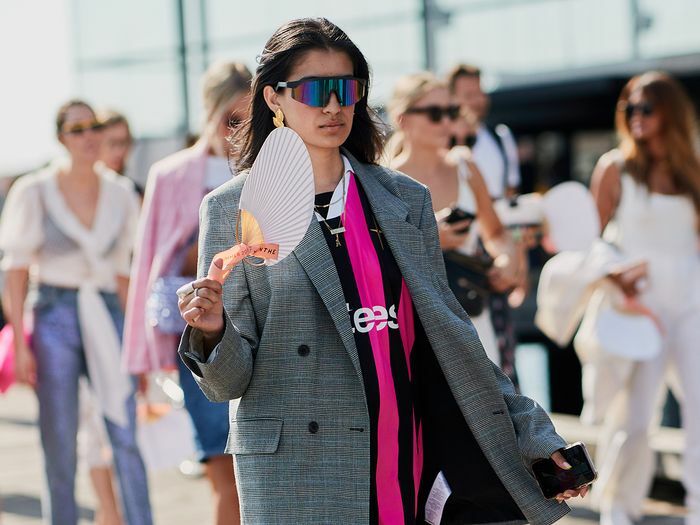 With all that said, behold my most noteworthy athleisure takeaways from S/S 19 Copenhagen Fashion Week. Considering how much hype this fashion week created, it’s safe to assume the six athleisure trends ahead will be everywhere come 2019, so get ready. After appointing Jens Werner as creative director, this season J.Lindeberg took on a new direction to redefine the brand by blending its core classic pieces with a focus on its heritage sport. 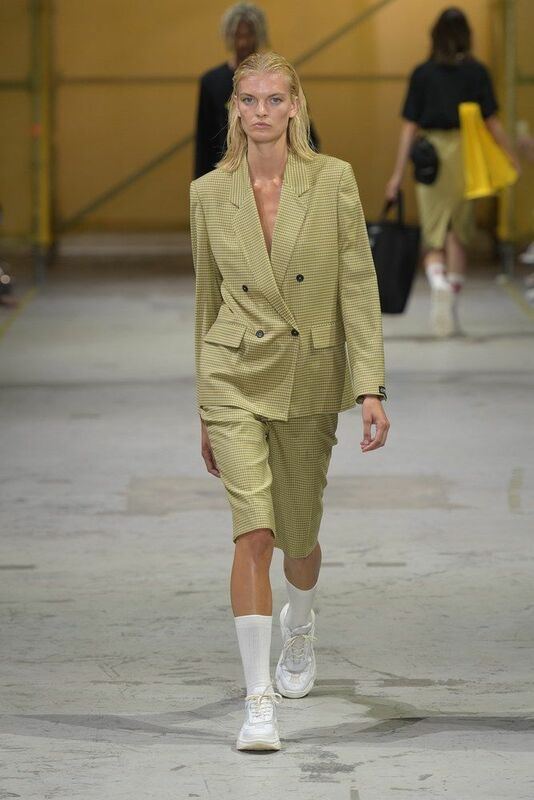 This season, this J.Lindeberg suit with Bermudas and sneakers gave new meaning to business casual. Adding a sport element to your business look is a great way to make it casual and add that element of cool. The way J.Lindeberg paired sporty pieces with trousers, suits, and blazers was most definitely a refreshing and attainable styling note. As one of the most hyped shows of the season (and rightfully so), this showing did not disappoint. Known for its flirty silhouettes, Ganni gave new meaning to being part of the #GanniGirls by infusing utilitarian edge into its S/S 19 collection. Models gallivanted down the runway to Nirvana setting the tone for a little rebellion—dresses paired with tie-dye vests, backpacks, Western doll dresses, and bucket hats with oversize strings. Ganni collaborated this season with Icelandic brand 66° North to bring functionality into the technical gear. But let’s not forget what really stole the show. Two words: hiker boots! This season, Baum und Pferdgarten took place in a quaint little art gallery. The walls decorated with beautiful paintings and the ceilings with exquisite chandeliers, setting the tone for a true Danish brand. Models wore a range of clothing from floral-print dresses to tailored suits, a gorgeous silk robe, and two-tone denim while carrying briefcases showing a versatile breadth of garments. I particularly enjoyed the street influence, especially with the pairing of an office-friendly skirt and a coach jacket. Following none other than the beat of her own drum, Cecile Bahnsen tells us that this season she decided to embrace her perpetual affinity for breathtaking pieces, staying true to her aesthetic. Bahnsen without a doubt demonstrated her commitment to ultimate craftsmanship, design, and attention to detail, from puffy puckered sleeves to lacy two-piece sets to bow-ties. Stealing the show were the combination of black Suicoke sandals with the soft fantastical tops and dainty dresses. Marching down the Østerbro Stadium this season was a cascade of futuristic, Olympic-inspired garments. Sitting there watching the drama and theatrics, I was truly reminded why I love fashion, and Saks Potts reminded me that it doesn’t always have to be so serious. Between dramatic leather jackets, high-top braids, and puffy printed coats, sport influences were everywhere. If attending Saks Potts confirmed one thing, it’s that tracksuits are here to stay. Bonus points for a logo print! I was stoked to hear Heliot Emil was showing this season at Copenhagen Fashion Week, especially because I’ve been swooning over everything it makes for quite some time now. Naturally, I was excited to see what direction their deconstructed and reconstructed looks would take this S/S 19. While the color palette remained true in Heliot nature—white, gray, and dark colors with ashy tones—cascading down the runway was a mix of different fabrications including sheer fabrics coupled with technical wear incorporated with bomber vests and gloves. Speaking of trends, shop the jewelry trend Zara just brought back in a major way.